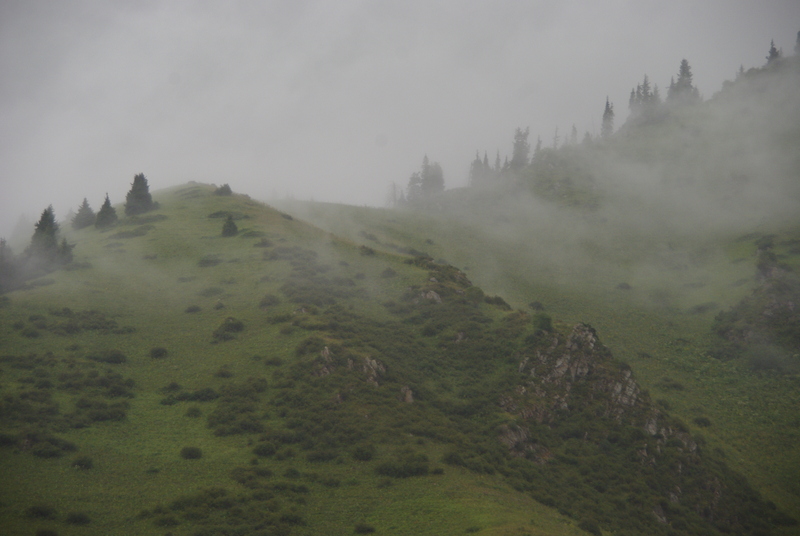 Kazakhstan is a forest-scarce country, with forests covering only 4.6 percent of the total area. Nearly 90 percent of the land is made up of steppe, desert and semi-desert. 26 million hectares are designated as forest estate (i.e. the forest fund), but less than half of this is actually covered with forest (12.5 million hectares). The national state agency in charge of forests manages 5.78 million hectares, or 20 percent of the forest fund. Regional governments manage 79 percent of the forest fund, while privately owned forest area is minimal. The 2003 Forest Code makes special provision for the establishment of timber plantations in the forest fund through a variety of mechanisms, including through partnership with the private sector. However, despite these provisions and the availability of suitable land, the private sector has not been heavily involved in establishing plantations in the forest fund lands. The recently completed Forest Protection Reforestation Project (FPRP) demonstrated significant demand for Participatory Forest Management, meaning where local communities participate in the management of forest resources in and around their communities. Results from the FPRP were influential in making changes to the Forest Code in 2012, including specific provisions for participatory/community forest management in the 2003 Forest Code. This activity builds on the FPRP and will contribute to the analysis and research required for the preparation of the proposed Forestry Development Project, which includes expanded components on participatory forest management and the establishment of plantations in collaboration with the private sector. 1. Analyze how land under the forest fund is currently being used, in order to determine to which areas are suitable for afforestation in partnership with the private sector and/or local communities. 2. Analyze the legal, regulatory, institutional and fiscal framework with respect to establishing plantations in collaboration with the private sector and local communities. This task will identify the reasons why there has been no uptake of the relevant provisions in the 2003 Forest Code, look into possible tenure models, and propose policy options. 3. Review attitudes held by private sector entities and local communities towards establishing plantations. A limited survey will interview potential investors and local communities. 4. Analyze market conditions and estimate demand for plantation products such as fuel wood; wood chips; pulp/chipboard; timber; and - in the case of local community forests -potentially fruits and nuts. This task will help ascertain local market prices for possible plantation products, and estimate the need for establishing local processing plants and the likelihood of there being sufficient local investors. 5. Assess the overall economic viability of different plantations and tenure models. Based on these outputs, economic models will be developed to investigate the economic viability of establishing large-scale plantations in collaboration with the private sector and local communities. This activity concluded in September 2018. The economic analysis showed that from the private sector perspective, the most viable plantation models are forest nurseries (pine, birch, spruce) to raise seedlings for the sale for ornamental and landscaping purposes, and fruit, nut and berry plantations. For energy plantations (poplar, saxaul, pine), once carbon values are factored in, the economic returns and thus the benefits for the economy as a whole are quite high. This provides good justification for the government to support the private sector in developing forest plantations, e.g. in the form of taking on the initial costs and risks of establishing fast growing plantations or providing payments for the global carbon benefits generated by plantations. In addition, this activity revealed that a much larger potential for suitable plantation areas seems to lie outside of the State Forest Fund altogether, on bare lands and naturally afforested lands within the agricultural land category (under pasture or straw-cutting lands). This activity has equipped decision makers by contributing to a better understanding of the legal, regulatory and financial obstacles and challenges facing Kazakhstan in developing private plantations. The knowledge generated further underlines the importance of engaging private investors and communities in the establishment of plantations, particularly in view of the global benefits provided by afforestation (e.g. carbon sequestration) and Kazakhstan’s international commitments to combat climate change. As such, the activity offers recommendations to leverage the carbon benefits provided by forest plantations (e.g. provision of carbon neutral sustainable goods and services) and better recognize and integrate them in national policy and forest management considerations. For more information, refer to the activity's synthesis paper on Kazakhstan Community-Private Plantations: Analysis to Better Understand the Potential for Developing Forest Plantations.